From Rhynie Square go east onto the road towards Druminnor Castle. About ½ a mile on the left is the stone circle in woods on Corrstone Hill. Reach the woods by walking up the edge of the fields; ask for permission at the Mains of Druminnor first. This is a narrow winding road - take care parking. 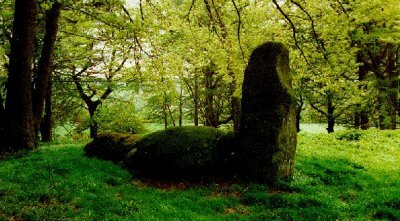 Of this stone circle, only one flanker and the long, broken recumbent stone remain standing. On the west arc of the circle three more stones lie fallen and moss-covered. Old pines, oaks and gnarled rowans grow in and around the circle. The name Corrstone is apt as there are lots of crows in the woods.